But don’t worry, you don’t have to move too if you want to feel better. After years of being abroad I came back to my home country for a while. And this change in circumstances brought a sudden realisation. While travelling across Europe: wherever I went, I longed for having a good gym with a sauna close to where I’d live. I don’t know why this Scandinavian practice has so much appeal to me, maybe I am meant to be in warm places, or maybe it’s just that European winters can get really cold, but whatever it is that’s attracting me to the idea, countless cold evenings – whether in London, Vienna or anywhere else – I’ve dreamt about going to a sauna. And now that I have moved to Warsaw, I have a giant swimming pool, gym and a sauna less than 5 minutes walk from my apartment (literally: door to door it’s less than 5 minutes – no more Ms.Lazybum). So it’s a perfect solution. Exactly what I wanted. I could finally go for a workout in the evening and then pop in to the sauna for a bit. Three months into living in Warsaw I realised that while I was going to the gym, I still have not used the sauna… not. even. once. I had the opportunity within reach. I didn’t even have to do anything extra to sign up for it. The sauna is at the gym, right next to the changing room which I was using at least twice a week anyway. So what the heck?! When I finally realised that, I thought to myself ‘enough is enough’. I went that very same evening. While I was chilling in the hot air I started wondering where else could I be doing this? Where else in my life I have been longing for something and as soon as the opportunity appeared, the longing would stop? …but I wouldn’t actually act on it? And why would I do such a (seemingly) silly thing? For me it took the form of regular visits to the sauna that were easily accessible, yet not happening, but it could’ve been anything. Maybe for you it is not wearing a gorgeous blouse/dress/handbag because you’re waiting for a non-specific very very special occasion. Or maybe you’ve got a nice perfume that is sitting on your dresser and you’re not actually using it, because… you know… it’s expensive. Or maybe you’re procrastinating on making a phone call to book yourself for that free facial you got as a gift card for your birthday. Do you see a common thread in all of these? 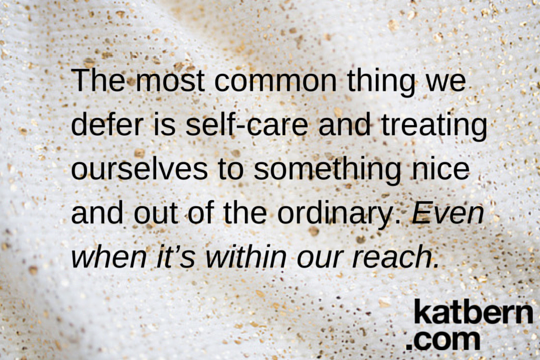 The most common thing we defer is self-care and treating ourselves to something nice and out of the ordinary. Even when it’s within our reach. Using something special or doing something (for yourself), which is outside of your normal busy routine is saying to yourself (and to the world) “I deserve this”. I deserve to take time off. I deserve to wear my best clothes and perfumes. I deserve to go and get a massage. So why do we defer taking actions that say those things? Even though we all know that ‘how you treat yourself is how others will treat you’? And even though we do want to feel better? Because we think we’re not good enough (yet) to deserve those things. We keep thinking that one day we will have it all together. That one day we’ll be thinner, fitter and more organised. And that THEN we will wear our best clothes/get regular spa treatments/go to sauna on the regular. One day. It’s all within the realm of dreams. And we long for those days “when we’ll be doing this”, obsessing about the future. And THAT IS WHY when the opportunity comes around, to do those dreamy things NOW, we don’t take them. We even stop longing for that particular thing too, because now that it’s available to us in the present (while we’re not yet fully deserving), it’s not so special anymore. Because we haven’t grown into this vision of ourselves we have in our heads. Vision for what we should be like. For what we want to be like. In what circumstances are you more likely to be productive? If you stay in bed in your PJs and throw some work papers all over the bed while in the background TV is playing the new episode of Madam Secretary? OR, if you get dressed and work from an actual desk? How we prepare our environment is affecting how we act and how we perform. If you start treating yourself now like the person you want to become, your chances for growing into this person or improving whatever it is that you want to work on are much better than if you stay in your PJs all day. So going back to that vision of ourselves that we have in our heads. What do you see this person doing? How do they go about their day? What do they eat? What do they want? How do they spend their free time? Because the truth is that if you’re able to imagine it, then that person is already in you. And she is deserving of the best you’ve got. You don’t need to change to deserve the best. You might want to change anyway, lifelong learning and improving yourself is a great quality to have. But you do not need to change anything to start being deserving of all the good things that are within your reach today. So go put on those expensive perfumes. Or use that gift card. Go to a sauna. Whatever pleasure and joy you’ve been deferring, go do it now. Otherwise you’ll be waiting your whole life. And that’s no way to treat the amazing miraculous being that you are. You do remember that there is only one of you in the entire world, right? Good. Now try to embrace that. P.S. Did that resonate? Can you already tell where in your life you’re not giving yourself what you wanted even though it’s within your reach? Leave a comment below. I would love to talk about this. P.P.S. If you’d like more tools and tips on how to be happier in your life (and what specifically you can do to make that happen), just like this article, then check out my FREE video series on The Crucial Shifts You Need To Make (And How) To Stop Playing Small And Start Living The Happy, SATISFIED Life You Want. I can’t wait to see you there! K.
Kat, everything is so true! Since I started going for dance creazy Kizomba regulary I feel so much better that even my girls started to dance again! Thanx for that truely words and advice!